The International Space Station's 3D printer has produced its first part, ushering in what proponents hope will be a new age of off-Earth manufacturing. The 3D printer, which was designed and built by California-based startup Made In Space, created an extruder plate — a piece of itself — on Monday (Nov. 24), wrapping up the hour-long task at 4:28 p.m. EST (2128 GMT). The milestone marks a key step toward a future in which voyaging spaceships print out their own spare parts on the go and colonists on other worlds make what they need from the dirt beneath their boots, advocates say. 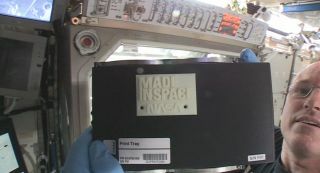 The extruder plate, which measures roughly 3 inches long by 1.5 inches wide by 0.25 inches thick (7.6 by 3.8 by 0.6 centimeters), features the logos of both Made In Space and NASA, Kemmer said. Choosing the plate, which holds in the printer's electronic board and wiring, for the first build has symbolic significance, he added. "We thought a lot about how we could demonstrate the historical shift here," Kemmer said. "It represents the idea that if something goes wrong on the space station, or future space stations, the crew and NASA now have the ability to build a solution." The 3D printer's presence on the space station is part of the 3D Print project, a collaboration between NASA and Made In Space. The machine launched in September aboard SpaceX's unmanned Dragon cargo capsule, then was installed in the orbiting lab's Microgravity Science Glovebox by Expedition 42 commander Barry "Butch" Wilmore on Nov. 17. Calibration activities quickly followed. The chief goal of the first phase of the 3D Print project is to validate 3D printing technology, making sure that it works in orbit as well as it does on the ground, NASA officials have said. Test items printed in space will be compared with identical samples produced by the same machine before it left Earth. The second phase will focus on actual utilization of parts printed out on the space station, said 3D Print program manager Niki Werkheiser, of NASA's Marshall Space Flight Center in Huntsville, Alabama. "I think we're making history by, for the first time ever, being able to make what we need when we need it in space," Werkheiser said on NASA TV when the 3D printer was installed. "Even though it may sound a little like science fiction, we're actually able to email our hardware to space instead of launching it." Made In Space sees a similarly bright future for the technology. Sometime next year, the company plans to launch another printer to the space station, on a production rather than a demonstration mission. Made In Space and NASA are also working together on a "recycler" project that will turn trash aboard the orbiting lab into 3D-printed objects. That could happen in 2015 or 2016, Kemmer said. And the company's long-term vision extends far beyond Earth orbit. "If we as a species are really going to be attempting to live off-world permanently — on the moon or Mars — we believe the technology that we're building can enable that future, especially if you start building with more and more of the resources in situ," Kemmer said.